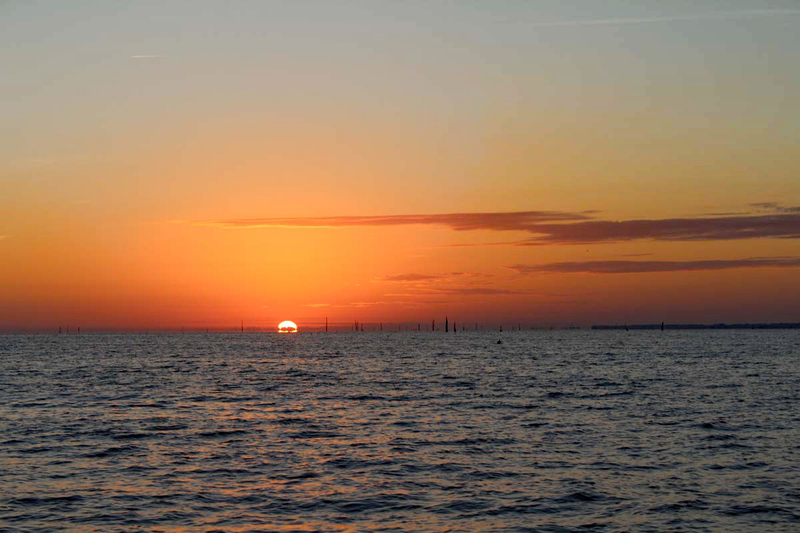 SANTEE, South Carolina – The sun was just peeking over the horizon as Capt. Boudreaux steered us across the massive Lake Marion near Santee, South Carolina. Seated forward of Capt. 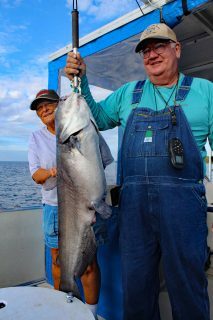 Boudreaux was his wife of 47 years, Capt. Barbara “Mouse” Witherell watching carefully as her husband expertly navigated around standing timber and logs poking above the surface. I could only imagine what lay underneath. One thing that definitely lay beneath was big blue catfish, our target species for the day, along with some healthy striped bass. After a 20-minute ride, drift socks were set out to keep the roomy pontoon boat perpendicular to the breeze. 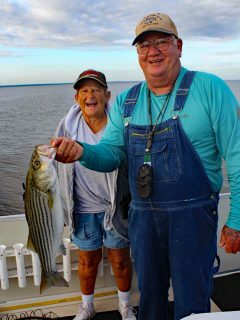 Mouse and Boudreaux, owners/guides with Santee Cajun Guide Service, had seven catfish rods dragging cut bait across the bottom along with a pair of rods pulling live bait, hoping for bonus stripers. The first rod to go down was, indeed, a striper that peeled line from the reel as it tried in vain to reach the opposite side of the 110,000 acre lake. The fish fell perfectly into the strict 23-25 inch size limit and went into the cooler for dinner. Decades ago Lake Marion was one of the most well-known striped bass hotspots in the entire nation. In fact the very first striped bass stocked in Tennessee came from the same South Carolina hatcheries that stocked Lake Marion. 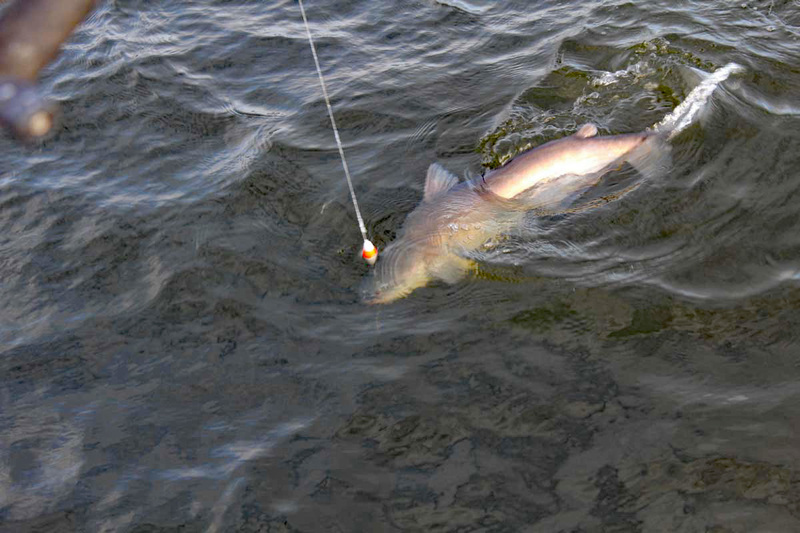 Changes in weather and other environmental influences, however, knocked the hot striper fishing in the head and many area guides turned to catfish. Blue catfish were stocked in Lake Marion in 1964. The fish took a liking to the great forage base along with the huge expanses of timber left standing in the lake and have since become a self-renewing resource for anglers. Fifty-pound blues are not an everyday occurrence but they are not unheard of either. South Carolina’s state record blue cat (113.8 lbs.) 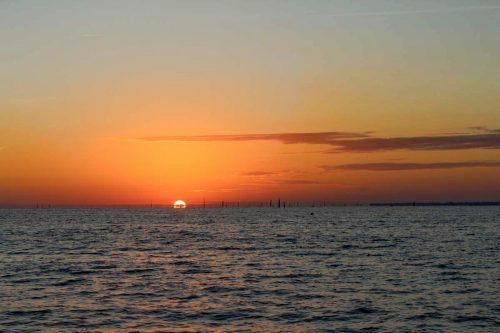 came from Lake Moultrie, the next lake downstream from Lake Marion in the Santee Cooper chain. It was actually Mouse who created Santee Cajun Guide Service. 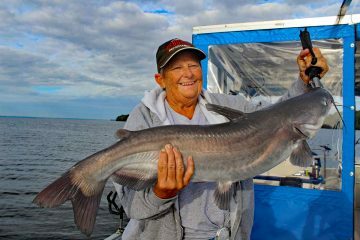 Mouse, 65, is proclaimed as one of the few, if not only, fulltime female fishing guides in the region. She carried her first clients out in 1998. After she went into business she learned that other guides on the lake had a pool going, betting on how long she would last. In 2005 Boudreaux tired of life on the road and started guiding alongside his wife. “I hired him,” said Mouse with a wry grin. It was about that time when a catfish rod tip snapped downward and my friend, Butch Thurmond, was battling the biggest catfish of his life. “That was fun. I’ve never caught a catfish like that one,” Thurmond exclaimed with a broad smile as Boudreaux and Mouse heaved the 32-pound blue over the side. Mouse stands about 5 feet tall, maybe. But that is just part of the reason for her nickname. 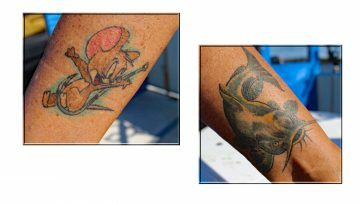 If you forget her name, or what she does, just refer to the artistic catfish and mouse tattoos on her calves. 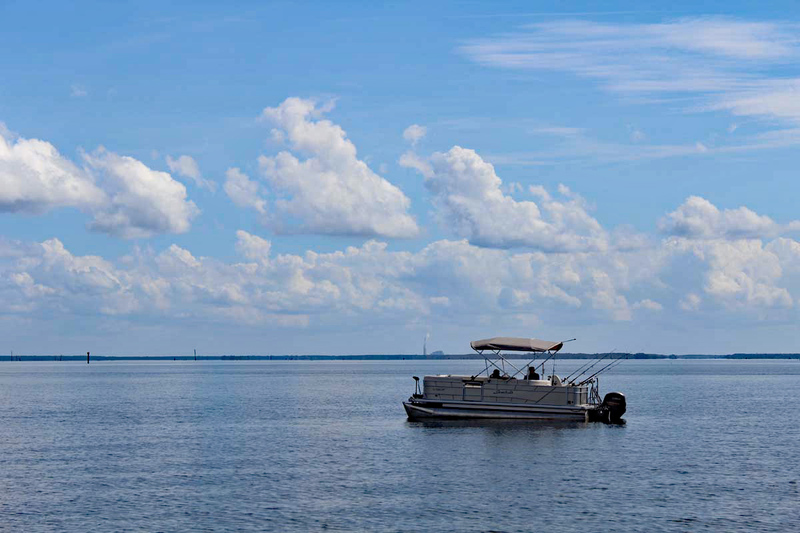 With 315 miles of shoreline reaching into five different counties, Lake Marion is the largest lake in South Carolina. Keeping up with the catfishing hotspots requires lots of time on the water. During peak season, Mouse, Boudreaux and even their son, Scott, are all on the water in separate boats with clients. The Witherells are obviously passionate about their chosen profession. The Witherells put their money where their mouth is. At Santee Cajun Guide Service children under 16 years old fish for free. 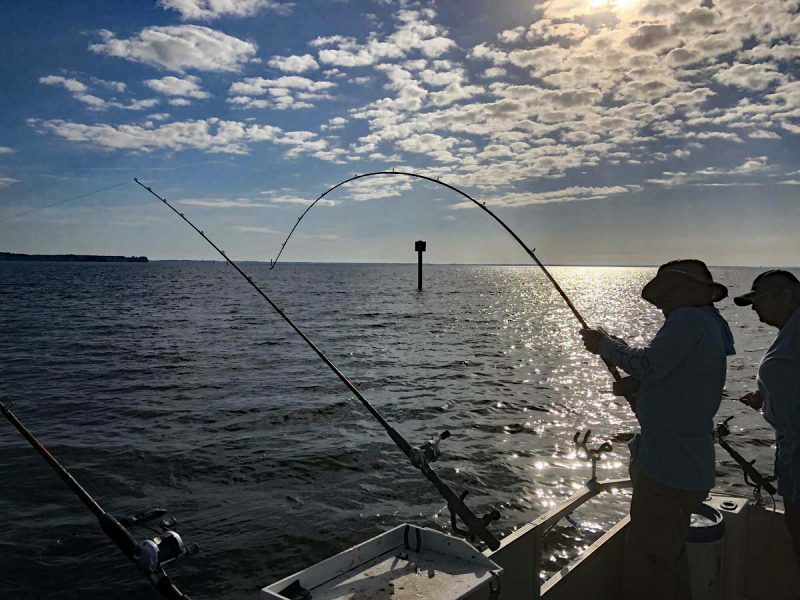 Our group of outdoor writers including me, Thurmond and South Carolina writer Terry Madewell, felt like kids at heart every time Mouse or Boudreaux screamed, “Fish, fish, fish,” when a rod bowed down. It was always a race to the rod as a dozen big blues and five stripers came aboard. 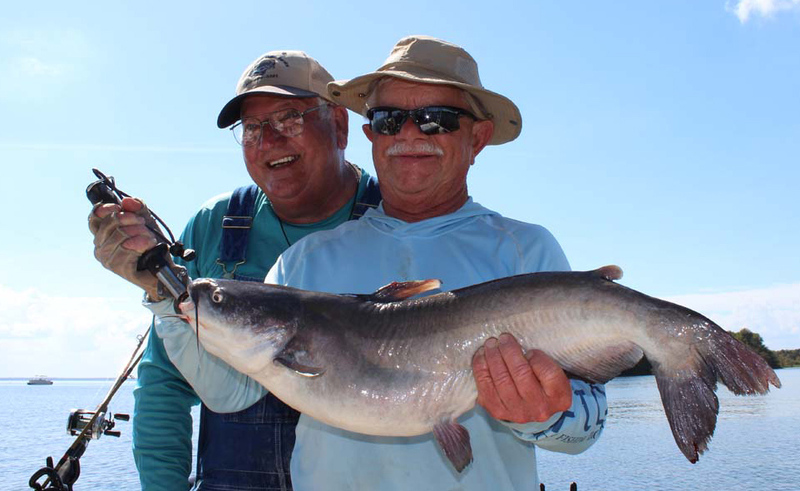 Mouse and Boudreaux fish separately when business is booming, but enjoy guiding together when they can. The pair works together like a well-oiled machine, cutting bait, tying hooks, hauling drift socks and otherwise doing everything it takes to keep baited lines in the water all the time. And all the while they are each keeping a diligent eye on every rod tip. One time someone joked about the pair as they once again screamed, “Fish, fish, fish,” when a rod bowed toward the water. Mouse is 65 years old however retirement is nowhere near in her future. “When I can’t get on this boat by myself is when I’ll retire,” she said. I’m betting folks will be listening to Capt. Boudreaux and Capt. Mouse screaming, “Fish, fish, fish,” for many years to come. Learn more about fishing Lake Marion and other things to do in the area on the Santee Cooper Country website.